Our studio specialises in elegant, corporate branding and websites focussing on the end user and business growth first and foremost. Rarely is this more important than for law firms for whom ‘acting for our client’ is the central tenet of business. Today we welcoming a wide range of law firms and Chambers of all different sizes (for projects large and small) to our client base. 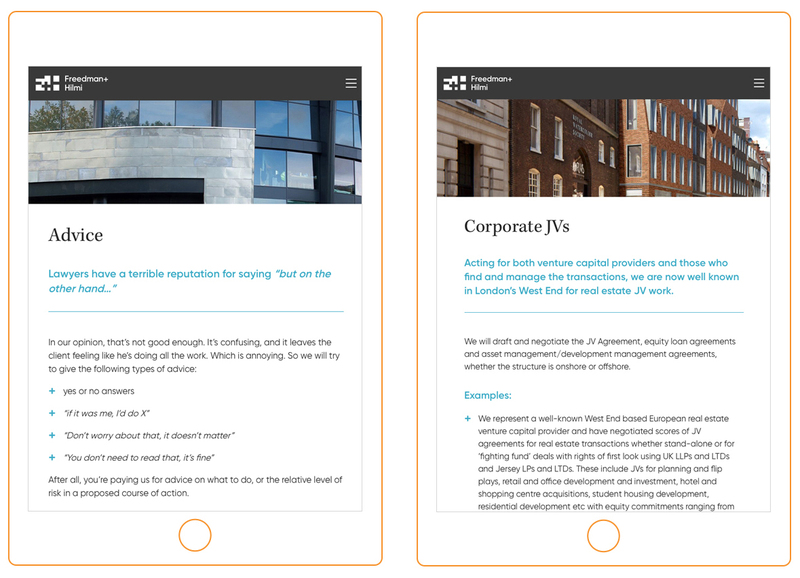 We have been responsible for several law firm web design projects, with examples of two of our key projects laid out below. We like to help Managing Partners with practical advice and – along with our partners in legal marketing and PR – a strong new approach to legal graphic design and branding. For a free quote, please contact us today on 020 7351 4083. Having spent many years working with investment firms, both specifically financial and also in specialisms such as real estate, it seemed a natural progression to work with law firms. After an introduction from a long-time client, we were invited to pitch for the corporate branding and website for their lawyers, Freedman + Hilmi. Fundamentally, the business is built upon a transparent, service-based approach to client management and this was at the essence of our design concept. 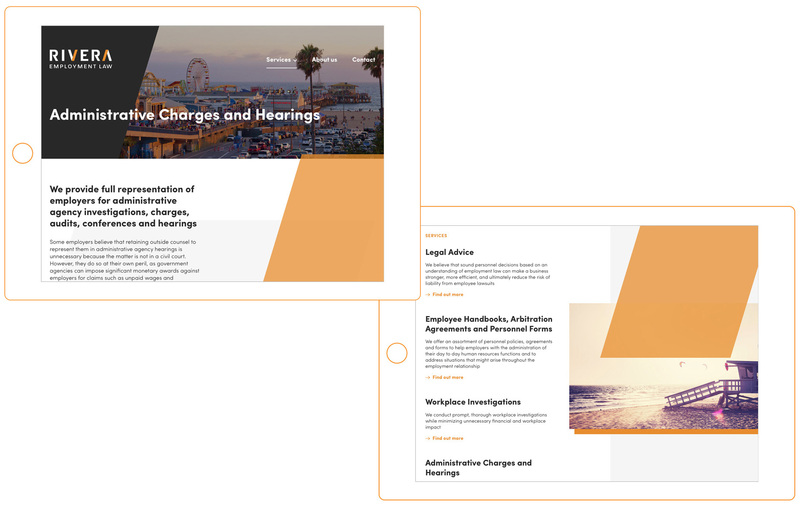 After seeing a series of the financial and legal identity and web design projects we had completed, Californian employment lawyer Kevin Rivera approached us to consider a branding and web design project for his Santa Monica-based practice, Rivera Employment Law. Our brief was to consider a modern design which stood apart from the large corporate firms in downtown LA and offered a European aesthetic for his business. The chosen brand is a modern, sleek piece of typography which has informed the design of the website. Employing a brand pattern, Rivera Employment Law’s online presence uses a bold diagonal over photography of different areas of Los Angeles. Additionally, the design has been programmed with parallax technology meaning that these brand elements float alongside the content, giving a sense of movement and pace to the site. ‘I had a very particular vision for the branding I wanted for my new legal practice and Richard and his team brought that vision to life. ‘In particular I wanted a website that stayed clear of the outdated, clunky images and graphics of so many law firm sites, and that projected a sleek and modern look that is easy to navigate.